MANILA, Philippines – After demolishing the “Great Wall of China” last Wednesday, Gilas Pilipinas proved that its win against Guo Ailun and defending champion team China is no fluke after humiliating Iraq in the 2017 FIBA Asia Cup in Beirut, Lebanon on Friday night, August 11. With Gilas Pilipinas’ biggest man, June Mar Fajardo still out due to multiple injuries, Coach Chot Reyes relied on his “secondary twin towers” of Christian Standhardinger and Japeth Aguilar as his front court starters. Japeth Aguilar played outstanding basketball against China last Wednesday especially in the defensive end with game-high of 5 swats. Last night against Iraq, Aguilar opened the game with another monster block but the Iraqis started hot from the perimeter and the outside for the early lead. Despite the good start, Iraq got into an early foul trouble after committing its 5th team foul with 5 more minutes in the first quarter. Gilas however wasn’t able to capitalize on Iraq’s penalty situation and kept the ball game close. 10 minutes passed by and Philippines found itself behind by 2, 19-17 in favor of Iraq with its naturalized player, Kevin Galloway topped all players with 11 markers. “The Beast”, Calvin Abueva who just spent over a minute on the floor last game due to disqualifying foul, still not in his superb playing form as he committed 3 successive fouls as the 2nd period unfolded. With 6:36 left in the 1st half, Gilas Pilipinas hit the foul limit that helped team Iraq widen its margin to half a dozen. Coach Reyes had no choice but to play small in the last 4 minutes of the 2nd quarter due to his big men’s personal fouls. Team Pilipinas might had played small in the dying phase of the half but it became a blessing in disguise as they beat the Iraqis in terms of speed and was able to tie the game to 29. Matthew Wright’s 3-pointer turned the tides to Philippines’ side with 1:20 left. Gilas trailed Iraq since the opening tipoff but nevertheless made a half-shot lead, 32-31 after the first 20 minutes of the ball game. At the start of the 3rd quarter, Japeth Aguilar got hit also by the foul trouble plague as he acquired his 3rd personal together with Calvin Abueva and Gabe Norwood. It was Christian Standhardinger who took over the vacated middle spot. Luckily, he delivered and single-handedly put Gilas on his back while the rest of the team was shooting blanks. 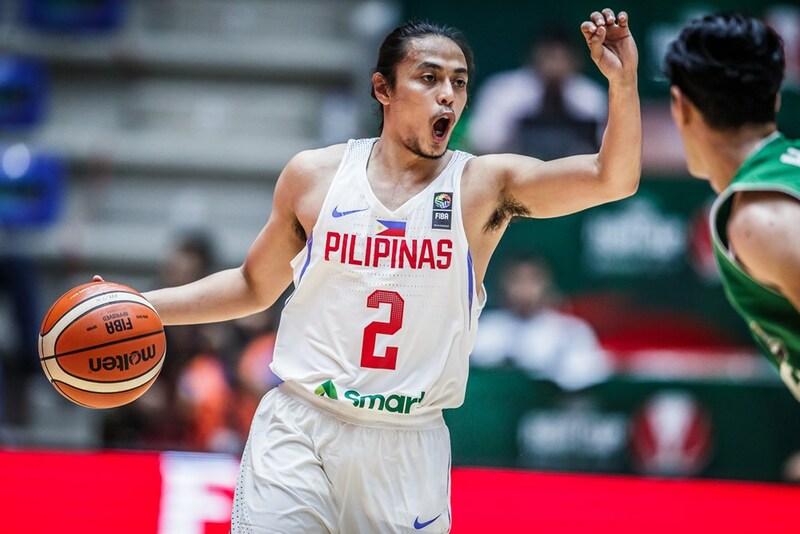 China-game hero Terrence Romeo started to wax hot in all angles of the floor and unleashed the true fury of Gilas Pilipinas. All of a sudden, Philippines was up by 14, 49-35 with over 3 minutes remaining in the third. Iraq went stone cold and even Kevin Galloway was shooting air balls while the rest of the team kept on piling turnovers which Gilas converted into scoring opportunities. Gilas Pilipinas ended the penultimate quarter with a 20-point, 60-40 humongous lead. Iran resumed its scoring chores in the final quarter. But the problem was, Philippines countered every shot that the Iraqis made. Kevin Galloway became active from the 3-point territory once again and managed to trim the lead to 16 which caused a major alarm for Coach Chot. Reyes immediately brought Terrence Romeo back on the court to provide fire power. Kevin Galloway exhausted his 5 personal fouls midway of the fourth so the locals stepped-up on his absence but still fell short in the hands of Gilas Pilipinas 84-68 led by Terrence Romeo with 17 points and Christian Standhardinger with 16 markers. With the win, Philippines topped its group with 2-0 and assured of a quarterfinals slot in the next round. On Sunday, Gilas Pilipinas will face another middle-eastern team, Qatar at 9 p.m.